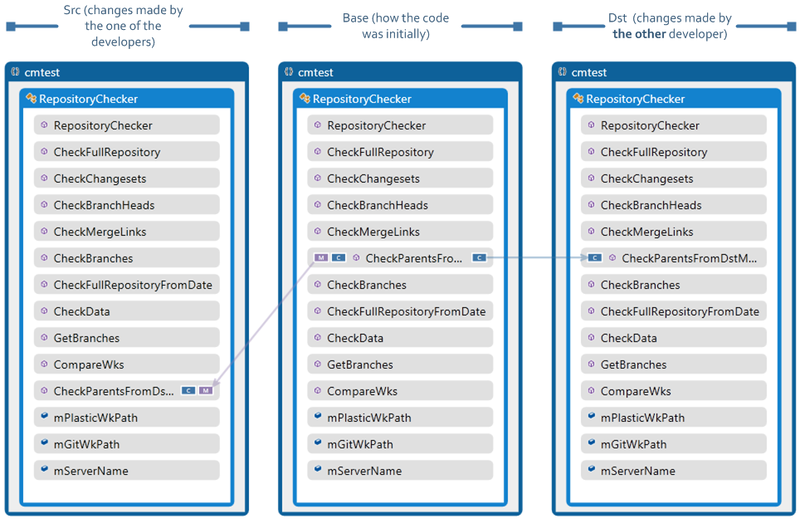 We switched to the latest open-source Roslyn in the previous release and now we’re adding more features based on that. Automatic method body merge resolution with the --merge-decl param: so far if a method (or any declaration body) was modified by the two contributors, the user had to manually launch the external 3-way merge tool to solve the conflicts, even when the merge was automatic. Now the new param forces Semantic to try to solve every method body so now the merge is as automatic as possible. (*Methods or any other declaration body). moved to a different location by the first developer and also modified (that’s why the icon is ‘c’ and ‘m’ (changed and moved)). changed by the second developer. Since the changes were made on non-colliding lines, the merge can be fully automatic. If you also add -a (which stands for ‘automatic’) the GUI won’t be launched and the result file will be directly created (for files with conflicts that can be automatically solved). This is the most important feature we have introduced in the last months: it really takes advantage of ‘understanding’ the underlying code structure to automatically solve as many conflicts as possible. Semantic basically knows the ‘reformat’ change can be discarded and then re-runs the text merge. Well, ignoring format changes during merge (or diff) can greatly help saving precious time without being distracted by trivial changes. That being said, code formatting is crucial for readability, so there will be many situations where you’ll want to preserve the formatting. In the case above Semantic made a decision: since undoing a format change avoids a time consuming (ok, not so time consuming this time, but you get the point) conflict resolution, Semantic will just undo the change to simplify the merge. Our goal is to make Semantic smart enough to avoid only the minimum number of reformats, so that the code preserves the preferences of the author. While it is still definitely work in progress, we’re happy to say that Semantic is able to do things beyond what any other diff or merge tool can!